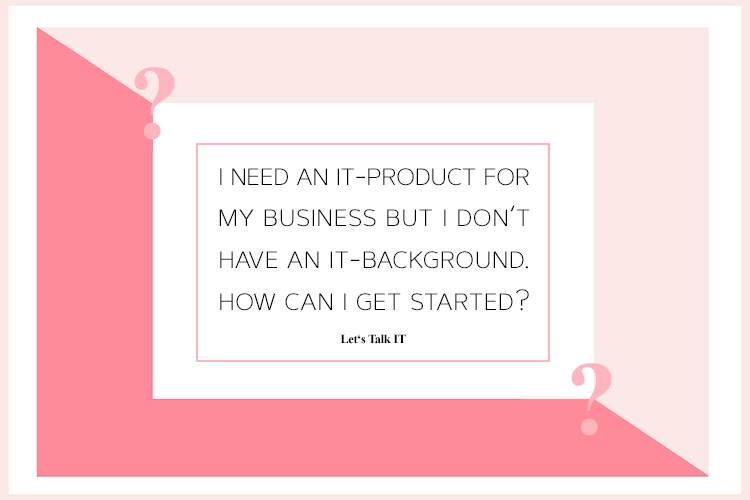 Most people who would like to integrate IT-products into their business need to rely on advisors and software companies. Sometimes, it may feel overwhelming to understand the products, assess offers and price quotations and effectively communicate with IT teams. When I started working in tech, I had degrees in business and international relations and work experience in Finance – I probably was at the point were a lot of you are now. I knew next to nothing about it. Therefore, I would like to talk about my learning experience with mobile apps and websites – about my goals, how I got started and how I learned and improved. I personally do not have a formal education in IT. However, in IT, a formal education is not the only entrance ticket. You can overcome that. While in business, law or medicine, it is pretty obvious what formal education means. While I think that investing in formal education always is a good idea, the IT field is a bit more ambiguous. The education really depends on which field you want to work in. IT is really broad – if you are a specialist in one coding language does not make you a specialist in all the others; some people focus on databases; others are more on the engineering side and code the mechanics of machines; some do not work on the software but on the hardware side. And a lot of it is practice. Most of the IT people who I know and consider real experts have a combination of both – formal education and a lot of practical experience. And “a lot” here really means a substantial amount of experience. Most of the coders started as high school kids. Those who started building websites when we were 14-15 (or even earlier), now lead teams at companies like Google or started their own IT companies. Unfortunately, I was someone who lost track of IT for some time. Even though I attended “computer camps” when I was in primary school and extra-curricular IT courses in high school, I stopped pursuing this interest for some reason. Only in my mid-twenties was I forced to teach myself the basics because I launched a mobile-app-based product and published websites. Starting out in the tech field with a business background and little IT knowledge made me “easy prey” in the tech scene. At first, I had no idea whether certain features were really needed, which parts of the code were essential or how long it would take to adapt the product. I knew I could not catch up with people who had been coding for years. Therefore, my very first step was the typical thing managers usually do: involve experts as advisors. By running everything through them and having it explained to me, I got a first feeling of the products and, probably more importantly, the minds of software developers. Furthermore, I usually choose team members and business partners based on my gut feeling – Can I trust them? Will they be honest even though you do not have the same area of expertise? I knew that having good advisors was a starting point. However, I did not always want to depend on other people. Hence, I decided to teach myself. Today, online learning options are endless and IT people are usually really excited to share their knowledge. I started out with Youtube videos. At this point in time, I had no knowledge whatsoever about how to build a website, let alone build an app. Hence, I signed up for courses by Codecadamy – with very basic HTML courses. My goal was to get an understanding of the products and to be able to effectively communicate with my IT teams. Even though I may not be able to build entire products by myself, I want to talk with those teams at an equal level. Imagine a female finance manager in her mid-twenties, in a room full of (mostly male) developers. In the beginning, I was not taken seriously at all. But over time, I got better, learned to communicate effectively and managed to put some great products out there. As I mentioned above, education is a starting point. But you have to take it further. While I did the online courses, I started building websites myself. I did this because I wanted to put the theory into practice. It felt really abstract to just go through code somebody else had built and which was not related to an outcome in real life. I wanted to create something myself and see if I can really do it. I decided to build a website myself. I assessed website providers such as Wix – but I soon realized that the rigid system is not the right option for me. I wanted to adapt the products to my needs. Hence, I opted for WordPress. (I also looked into Joomla.) Over time, I got used to changing parts of the code and becoming more flexible with the system. To sum up, I would like to compare software development with learning languages. There is a reason why we call them coding “languages”. Learning them is very similar to learning a foreign language. When you learn a language like French you need to learn how to pronounce the letter and words, you need to understand grammar and then put it into practice by speaking and reading it. Programming languages work in an analogous way, the only main difference is that your way of speaking is by typing the code and having it come to live. From my own experience, I can tell you it is not as daunting as it may seem at the beginning. I do not say it is easy for IT-newbies but I do think with the right mindset and effort you can do it as well. Do you work in IT? What is your opinion? Please share your experience in the comments or on my social channels. I am excited to hear what others in the field do! All recommendations are based on the personal experience of Elisabeth Steiger, no fees were received. Where Shall I Start My Business?